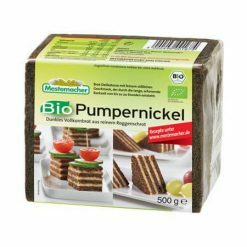 Organic traditional German pumpernickel bread. This organic bread delicacy has a fine sweet flavour, caused by the long, gentle cooking time of up to 20 hours. A delicious rye bread made with freshly ground organic whole-grain rye at the Mestemacher in-house mill, it can be enjoyed with a variety of toppings such as ham and cheese. With a presence in more than 80 countries, Mestemacher is the global market leader in long-shelf-life wholemeal rye and speciality breads. Having begun as a village bakery in 1871, the company has a long history in delivering delicious organic wholegrain and pumpernickel breads. These breads offer many health benefits and are an important source of dietary fibre. All are made from natural rye grain, freshly ground in MestemacherEEs mill, ensuring valuable minerals ae retained. The company uses sourdough rather”an chemical additives or baking aids, and its raw materials are sourced from specially tested suppliers. Due to their long shelf-life as a result of pasteurisation, the breads are also highly suitable as emergency food. Mestemacher has an IFS (International Featured Standards) food certification. Its organic range is accredited with an official organic seal and its breads are certified as kosher. The company has also received the Preis der Besten, an award for high-achieving businesses by the German Agricultural Society.